However certain times of the year can make it easier to satisfy particular interest. For example, if you would like to see plenty of whale action then departures in August and September are definitely for you! 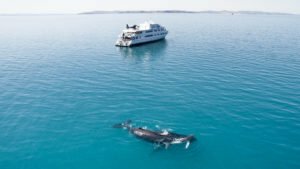 From late July humpback and southern right whales reach the Kimberley after swimming-up the west coast to reach breeding grounds in the north and it’s very common for guests to get great views of whales breaching and basking on the surface. Our departures in August are also a great time to see the rest of the Kimberley – The Broome Cup is in August, so is the Shinju Matsuri festival and, it’s the best time of the year to see all of the Kimberley’s iconic national parks. Book your ‘whale season’ adventure cruise now.